Service Costs > How Much Does Dry Cleaning a Leather Jacket Cost? How Much Does Dry Cleaning a Leather Jacket Cost? Due to the nature of the leather fabric, cleaning needs to be done by a professional to ensure that the quality of the jacket stays the same while the jacket is being cleaned and pressed. Professional leather jacket cleaning takes years of experience, skills and patience, and the cleaning techniques will greatly vary depending on the type of leather, the extent of the stains and the construction of the design. A skilled dry cleaner who’s able to clean your leather jacket should be able to clean the jack, restore the original color, remove any stains and recondition any signs of cracked leather. How much does dry cleaning cost for a leather jacket? Depending on the dry cleaner and the size of the jacket, the costs of dry cleaning a leather jacket will typically be between $35 and $85. The costs, however, can be much higher if you needed any alterations, repairs and/or colors restored. NY Organic Dry Cleaners in Rego Park, New York, offers leather jacket dry cleaning services for $40, according to their official pricing sheet. According to CleanersToYourDoor.com, the average cost to clean a regular jacket smaller than 30 inches will cost $40 to $50, whereas a full coat, down to your knees, can cost up to $80. When you take your leather jacket to the dry cleaners, the first thing that they will do it tag it so that it does not get confused with any of the other items in the service. 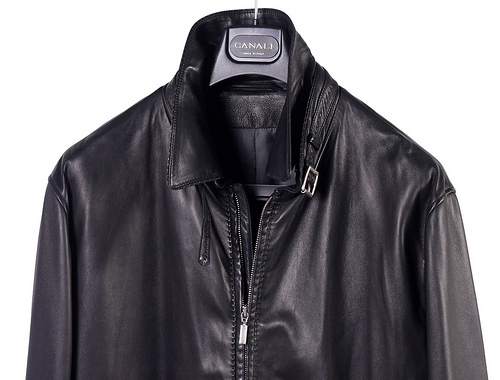 Your leather jacket will be gently cleaned, dried and then the natural oils, which are depleted from the skin during a natural cleaning process, will be replenished. Color touchups and/or restoration, if necessary, may be applied to revitalize the jacket. The entire process can take anywhere from 24 to 72 hours, depending on how busy the dry cleaner is. Any tears, holes or rips can be repaired for an additional $25 to $50, on average. If the leather jacket needs to be re-colored, this can often be an additional $40 to $80 on top of the estimates mentioned above. Many delivery companies can pick up your garments for a slight fee, depending on the distance they have to travel to your residence. These fees are often $20 to $30. Alterations, if necessary, can be done as well. This may include adding a zipper, shortening the sleeves or adding a new lining. All of these alterations can, depending on the type of job performed, cost $40 to $80. It is recommended that the leather jacket is dry cleaned at least once a year in order to retain its quality and ensure its longevity. Do not leave leather jackets inside a plastic bag. As soon as it arrives from a dry cleaner, remove it right away from the plastic to allow the leather to breathe and to avoid trapping moisture in the fabric. Shop around, especially if you live in a busy area. While you don’t want to focus on the price, play close attention to their cleaning methods and reviews online as well. If you take multiple items to the dry cleaners, you will most likely be charged less per item. Dry cleaning, according to Jennifer Halloran at EditbyDesign.com, can be machine washed, but as with anything, do it at your own risk.